As a kid, seeing goldfish swimming around a tank can be rewarding, soothing, reflective, and now, flat out COOL. Genetically modified Glowfish are sweeping pet stores like Petsmart by storm. During the day, you will notice your swimming pets give off bright DayGlo colors, but under ultraviolet lights, GloFish give off the coolest light ever. See the video below for how these fish can look. Now contrary to what you may believe, GloFish were not made by Igor to help bring Frankenstein to life, but these were actually created to help fight water pollution in helps to aggressively find toxins in water. 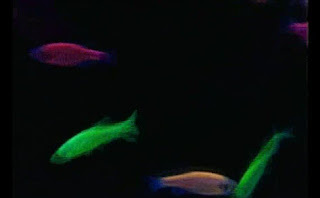 All proceeds for GloFish go right back into R&D lab where these swimming creatures were created.